Great post. Thanks for sharing. I forwarded it to my department chairs because I know some of them are considering launching their own e-newsletter. Hi Libby – great post, thanks! 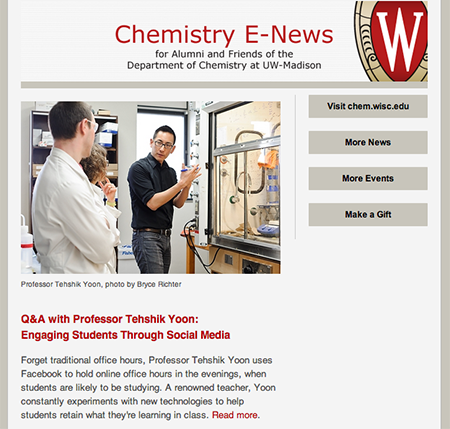 We use mail chimp for our our departmental e-newsletter as well. One challenge we’ve encountered is we haven’t found a way to archive our past issues as web pages so folks can easily access and peruse past issues. I’m wondering if you’ve found a way to create a static link to your e-newsletter in MailChimp? The link in your post to your first issue didn’t work for me… Thanks! Great questions, Anne! MailChimp does have a nice archive feature (view the archive of our Chemistry Alumni E-News: http://us5.campaign-archive2.com/home/?u=f0ebf5054bac63ff1ead97c3d&id=4528f02740), but I’m also considering creating a landing page of sorts for the newsletters on our website. This might be as simple as creating a newsletter section that has a page with links to the stories included in each issue of the e-newsletter. I’ve always shied away from this approach, but I’m starting to see the value of having a repository that lives outside of the email service provider. I’d love to hear if you think of a better solution or approach!